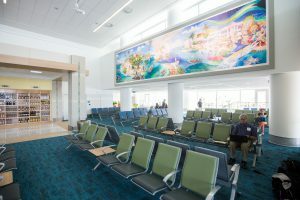 In redeveloping Lynden Pindling International Airport, Nassau Airport Development intentionally created a place of experience, where architecture, art and landscape reflect and celebrate the iconic destination that is The Bahamas. 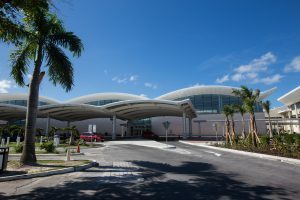 This approach, a hallmark of Vantage Airport Group’s network airports, means that from the moment passengers step off the plane and into LPIA’s terminals, they know that they are in The Bahamas. This sense of place is on display through thoughtful architectural design elements, such as the airport’s undulating roof line, reminiscent of an ocean wave. 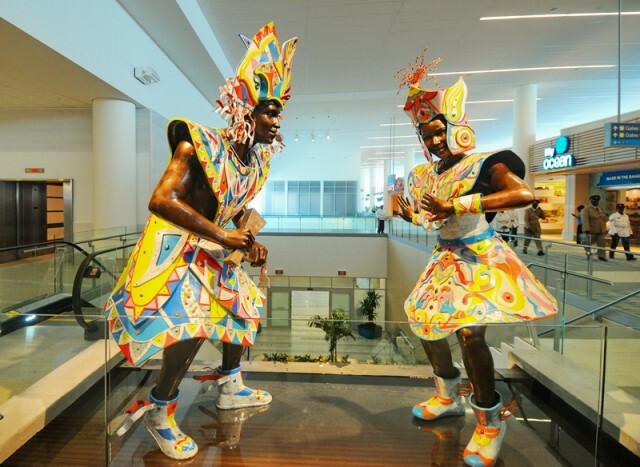 It is further brought to life with the airport’s incredible collection of custom art, most of which is the work of local Bahamian artists who were commissioned to create pieces expressly for the redeveloped airport. 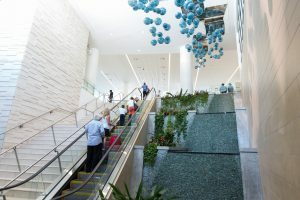 In fact, over the course of the four-year, three-stage terminal redevelopment, 13 unique pieces of art were commissioned and installed. From wall-spanning murals and larger-than-life statues to breathtaking water features, the redeveloped LPIA offers visitors a spectacular introduction to the culture and artistry of The Bahamas. 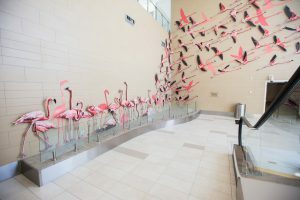 Some of the collection’s standout pieces include Taking Flight, a large-scale installation featuring The Bahamas’ pink feathered ambassadors, West Indian flamingos, taking flight across several walls in the Departures area of the Domestic & International Terminal. Rendered in oil paint on aluminum, there are 84 life-sized flamingos in the flock. 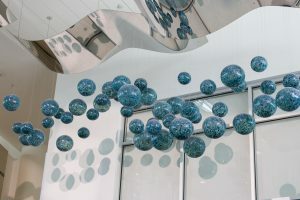 In the same terminal, passengers descend an escalator under Bubbles, a collection of more than 150 hand blown marine blue glass orbs of varying sizes, suspended from a sheet of reflective stainless steel high above. In the U.S. Terminal, passengers regularly stop and take photos with We Rushin’, a riotously colourful pair of bronzed figures, dancing in full Junkanoo costume, the dazzling traditional street performance art of The Bahamas. Also celebrating the best of The Bahamas is Bahamas Experience, a lively mural gracing the wall above the Departures gate area in the Domestic and International Terminal.